The ADS-1500W gives you the option to scan to a number of different destinations. You can scan documents to cloud applications1 directly from the 2.7" TouchScreen Display. 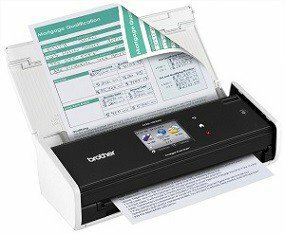 You can also scan to your USB flash drive2, or to compatible mobile devices using the free Brother iPrint&Scan app3, or scan to a file, email, image, or one of many other application. The ADS-15000W includes an enhanced package of scanning software to help you manage and distribute information and reduce the need to store and reference hard copy documents. BR-Receipts lets you export your receipt data into Quicken and Quickbooks software to help simplify bookkeeping and reporting4. Brother stands behind your purchase with free phone support for the life of your product. Whether you have a question or a technical issue, Brother is always at your side. 1. Requires internet connectivity and account with desired service; additional purcase may be required. 2. USB flash memory drive not included. 3. Requires connection to a wireless network. See brother.com for details, availability, and mobile device compatibility. 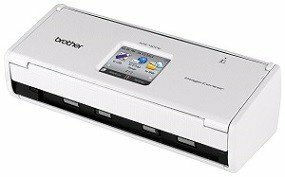 The Brother iPrint&Scan is not available in all countries. 4. BR-Receipts software available via download from Brother Online (only available in the USA). 5. Color and monochrome scan speed, letter size paper at 300 dpi. 6. Single sheet, single-sided, 14-29 lb bond. 7. Windows only. Nuance PDF Converter Professional not supported by Windows XP 64-bit. 8. Requires Android cable supplied with phone or tablet. 9. SANE driver available for download from Brother Solutions Center. All trademarks referenced herein are the property of their respective companies.